I have been craving chicken noodle soup lately. The warmer and brighter weather makes a giant bowl of soup seem less appealing than if we were still stuck in the thick greyness of winter. I used chicken I had cooked in the crock pot before shredding and then freezing in 2 cup portions. I am rarely this organized, but I’ve been putting in more of an effort lately and I’m surprised how helpful little things like this can be when you think you’ve run out of groceries and feel too lazy to walk to the grocery store. If you don’t happen to have leftover shredded chicken either buy a rotisserie chicken or poach 2 chicken breasts in stock and white wine or vermouth if you have some lying around. 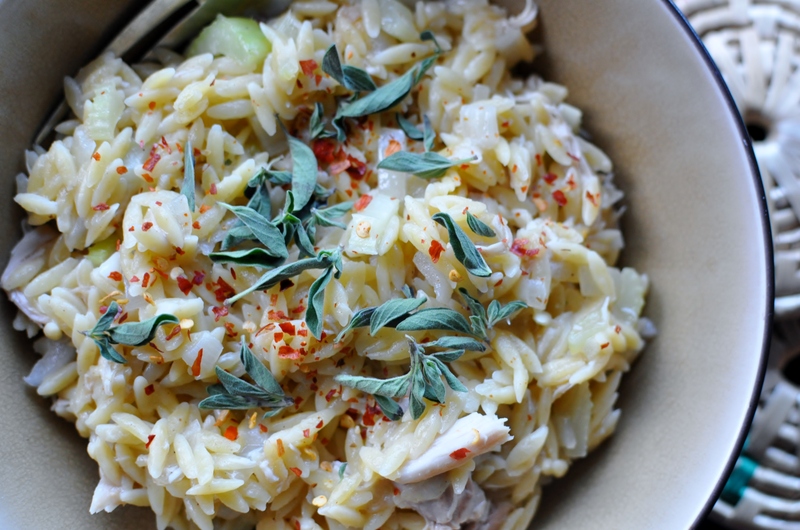 Orzo is my favourite type of pasta, its chewy bite is a perfect substitute for arborio rice in this recipe. I like to throw in a Parmesan rind or 2 I have some in my freezer, just fish them out of the risotto before serving. 1. Heat the oil in a large sauté pan over medium heat. Cook the onion, garlic, and celery and a generous pinch of salt until softened before stirring in the orzo. Stir the orzo until coated in the onion mixture. 2. Add the vegetable stock all at once and allow it to come to a simmer, stirring occasionally to prevent sticking. Cook the orzo in the stock, continuing with the stirring, for about 15 minutes or until all the stock has been absorbed. 3. Stir in the chicken, lemon juice and zest, Parmesan, and salt to taste. Serve in shallow bowls with more Parmesan, fresh herbs of your choice, and a generous sprinkling of dried red chilies. This song is just like floating. Your chicken noodle soup looks yummy! Its time for it to make this again. Been a while! I hope you enjoy! Chicken noodle soup is perfect any time of the year, I think.